Cardiopulmonary resuscitation – otherwise known as CPR – has literally been a lifesaver for hundreds of years. With changes to the guidelines and new recommendations to optimize CPR techniques being released on an almost annual basis, this emergency medical procedure may certainly seem modern, but the fact is, it’s a procedure that’s been in practice to some degree since the mid-1700s. One of the most intriguing things about medicine is its long, sordid history. The assumptions, the educated guesses, the risky tests and experimentations, the sometimes downright barbaric techniques – all of these things were born out of the unquenchable desire to learn as much as possible about the human body. Recognizing the many ways our predecessors got it wrong over the years makes the invention and ongoing application of CPR that much more impressive. This one seemingly simple development of recommending the use of mouth-to-mouth resuscitation to reduce the high number of drowning deaths has since saved countless lives. We thought it might be interesting to take a little walk down memory lane to discover exactly where CPR came from, how the procedure has developed and evolved over the years and what brought us to where we are today. Let’s take a look! One of the most prominent features of the city of Amsterdam is its vast network of canals. Not surprisingly, for much of the area’s early history, these water-filled passageways served as the primary means of travel to and from other locations. Everyone from casual travelers and sightseers to business professionals utilized canals on a daily basis. Sadly, this method of transportation resulted in approximately 400 deaths due to drowning per year. In an effort to reduce this number and save more lives, a group known as the Society for Recovery of Drowned Persons was formed. Some of the group’s earliest methods – such as bloodletting – were questionable at best and downright dangerous at worst. Some techniques that they developed, although rudimentary in nature at the time, have contributed to the modern-day practice of cardiopulmonary resuscitation and can still be seen in use (to some degree) today. These early methods included the application of pressure to the abdomen and the positioning of the feet above the head. The ultimate success of these treatment methods has given rise to such renowned organizations as The Royal Humane Society in London – a group that is widely considered to be a precursor to the emergency medical services we know and use today. Over the course of the next 140 years or so, the development of what would eventually come to be known as modern-day CPR progressed at a relatively slow pace. During the early part of the 20th century, however, things started to gain some momentum. In the year 1904, a physician by the name of Friedrich Maass began successfully performing chest compressions on humans. Another doctor – Dr. George Crile – also reported success with the use of both closed-chest cardiac massage and external chest compressions. By the time the 1950s rolled around, Doctors Peter Safar, James Elam and Archer S. Gordon began working to perfect modern CPR methods, including the development and use of the rescue breathing technique. By 1959, Dr. Elam had developed an instructional booklet entitled “Rescue Breathing,” which ended up being distributed all across the country. Thanks to improved publication methods, it became possible to train people in mass numbers. Slowly but surely, the process of rescue breathing was successfully adopted by such well-respected organizations as the Medical Society of New York, the American Society of Anesthesiologists and the National Academy of Science. The Red Cross followed suit shortly thereafter in 1960. By this point in time, CPR had become the widely accepted method for the emergency treatment of sudden cardiac arrest and drowning. By the early 1970s, most of the country had the infrastructure in place that would ultimately help CPR reach its fullest potential as a truly life-saving treatment methodology. Defibrillation had become more widely available, people were becoming more knowledgeable and the ease of access to ambulatory services facilitated quick and effective intervention in life-threatening circumstances. The foundation had been successfully laid to spread awareness and training for CPR across the globe. In order to speed this process up, a program was developed in King County, Washington, which was designed to deliver expert training to emergency dispatchers. This training enabled the dispatchers to deliver step-by-step instructions over the phone for how to perform CPR. With this extra step, sufferers of cardiac arrest and other sudden life-threatening incidents could begin receiving emergency medical care while awaiting the arrival of EMTs. 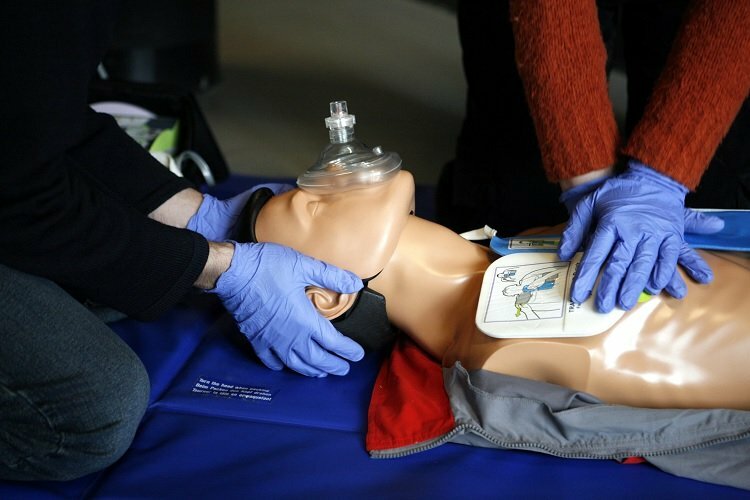 While holding a certificate in CPR training is always preferred, this method of early intervention with individuals with no prior training has proven to be remarkably effective in keeping patients viable until trained medical professionals can arrive on the scene. It has, undoubtedly, saved countless lives. During more recent years – from the 1990s to the present – the focus has shifted a bit to involve a combination of refining treatment methods while also continuing to spread awareness. A number of committees and task forces, such as the International Committee on Resuscitation, have been assembled to support and propagate these initiatives. Most recently, the American Heart Association (AHA) has modified its recommendations, releasing a statement about Hands-Only™ CPR in 2008. This new policy basically states that bystanders who witness the sudden collapse of another adult should immediately call 911 and thereafter deliver “high-quality chest compressions” by pressing hard and fast in the middle of the patient’s chest. In 2010, the 50th anniversary of CPR, the International Consensus on ECC and CPR Science with Treatment Recommendations (CoSTR) Conference officially released the 2010 American Heart Association Guidelines for CPR & ECC (pdf). And in 2015, the Institute of Medicine released a report entitled “Strategies to Improve Cardiac Arrest Survival: A Time to Act.” That same year, the latest version of the AHA guidelines for CPR and emergency cardiovascular care (ECC) was released. Considering the many drastic changes that have occurred across the medical spectrum over the years, the fact that CPR has remained relatively consistent is pretty remarkable. Interested in learning how to perform CPR or becoming CPR certified? Get started for as little as $35 today!